How can I integrate my cat into its new environment and what should I feed him? There are bound to be many questions regarding your feline friend, whether you’re a new owner or just looking for advice. To help you out, we’ve compiled a list of frequently asked questions from Cats Protection’s National Information Line. Check out our downloads for more information. Please note: If you have any concerns about your cat’s health or behaviour please contact your vet as soon as possible. These FAQs are designed to give you basic information and should not be seen as a replacement for veterinary advice. Although cats can form social bonds with people and other cats, it's no surprise that cats are a species that are content to be on their own. They are, of course, developed from a species that is largely solitary and highly territorial! Social contact occurs usually between cats of the same social group, which could explain why other cats are chased away as they are often seen as a threat! How can I introduce my new cat to my existing cat? This issue is very common – in fact, problems arising from the stress of introducing a new cat to existing cats are some of the most common reasons for cats being returned to Cats Protection adoption centres after homing. Introducing a new cat into a household is often stressful for both the existing cat and new cat, so the process has to be carried out slowly and carefully. Cats can be social with other cats but only as part of an established ‘social group’. They are most likely to form close relationships with other cats when they ‘grow up’ together, or where a relationship is developed over a long time – cats that are unfamiliar are usually seen as a threat. Resident cats can be very stressed by the sudden introduction of an unfamiliar cat and might react with aggression, hiding away or avoiding the new cat. Other signs of stress might include urine spraying or over-grooming. When introducing your new cat to your existing cat, keep the process slow and gradual. Firstly, set up a room for your new cat that is not one of the ‘core’ areas for the existing cat. This room can be set up with a litter tray, food, water bowl, comfy bed, toys and a scratching post and establishes a safe place for your new cat to get used to, as well as a ‘core’ part of his territory. It is important for your new cat to relax into his surroundings and get to know you, before facing the challenge of meeting your other cat. Cats rely on scent for communication and identification. The introduction process should start with the ‘swapping’ of scent between the cats, by exchanging food bowls, toys and bedding. Through this process, the presence of the other cat should be associated with something positive, such as attention, play or a food treat. Only when the cats tolerate the scent of the other cat should you be able to introduce them to each other. Be prepared, integration can take anything from a few weeks to a few months, depending on the age, character and previous experiences of your cats. Taking your time will make it worthwhile in the end. How can I integrate a cat into a household with dogs? This is likely to depend on the character and previous experiences of both animals. If you have a cat that has previously lived happily with a dog, they are likely to accept a new one more easily than those that have either not seen dogs before - or been chased by them! Equally, dogs that have lived calmly with a cat are generally easiest to introduce to a new cat than those that haven't had any interaction with cats at all. When it comes to integrating cats and dogs, the process needs to be slow and careful to make sure both the cat and dog are not stressed and that chasing and running responses do not become established. The easiest time to integrate dogs and cats is during their 'socialisation period' (up to eight weeks of age in cats and 12 weeks in dogs), during which time puppies and kittens will accept the presence of the other individual as normal. Why do cats sleep all the time? Cats tend to sleep an average of fifteen hours a day, which might be why you believe your cat does more sleeping than anything else! This is mainly due to their natural instinct. In the wild, cats need to spend a good proportion of their time hunting for food alone. They only have themselves to rely on to find enough food to survive and as a result, have to keep going until they are successful. As hunting usually takes place when the natural prey of the cat (small rodents) are awake, this usually happens late in the evening or early in the morning. Hunting is hard work for cats and they tend to rest and sleep for much of the rest of the day to conserve energy. It often seems to us that our cats sleep a lot because they sleep during the day when we are awake! Sleeping habits vary in one cat to the next - some are particularly inactive and will rest for a large amount of the day. This also might occur when their activity patterns are inhibited in some way; for example, indoor cats that do not have an enough to keep them occupied might become quite inactive. Can a cat be trained? Yes, cats can be trained. They can, for example, be taught to come when called, 'sit', or do tricks such as 'give a paw' - many cats will even enjoy training sessions! It's important to note that cats aren't an easy to train as dogs. One reason for this is that dogs are more likely to find toys, attention and food treats 'rewarding' and soon learn that doing tasks will be rewarded with treats. If you want to train your cat, find something they really like - prawns or a piece of chicken will be enough to reward them so they learn new behaviours. Cats also concentrate on training for a shorter amount of time, so keep sessions short and sweet! Cats, just like dogs, can be trained successfully using 'clicker training'. When it comes to toilet training, cats are generally very easily house-trained. In most cases, kittens learn to toilet in the appropriate palce when they are very young and taken to the litter tray by their mother. My cat is acting out of character, is something wrong? Unfortunately, there could well be something wrong. Changes in behaviour can often be an external indication of physical or psychological issues. Changes in the way your cat eats and drinks, activity levels, social interaction or the development of aggression or hiding away could all be signs something is amiss. Consult your vet to check there are no physical problems. They should be able to refer you to a qualified behaviourist if the change appears to be linked to a psychological issue. Although we find urine spraying unacceptable, spraying is actually a normal scent marking behaviour in cats. Cats use scent signals a great deal to orientate themselves and communicate with others. Facial and flank rubbing and scratching are other behaviours that also leave scent marks. Urine spraying is used more in unneutered male and female cats, especially toms, as it is used to indicate sexual activity. However, spraying will also occur in neutered cats. Spray marks tend to be used in those areas of a cat's territory where a cat feels insecure or threatened, such as where other cats are around. Most often this occurs outside, but can also occur indoors if a cat is stressed inside. My cat is extremely frightened of a new cat in the neighbourhood. Is there anything I can do? You are not alone this is a very common problem. Cats are naturally very territorial and where there are lots of cats in a small area, there can often be conflict. Conflict between cats in a neighbourhood can result in behaviours that are obviously related to conflict, such as wounds from fighting, or urine spraying in areas where territories overlap. However, some cats respond to the close proximity of other cats by becoming very nervous or frightened. This may result in them being unwilling to venture outside. Being stuck inside can have other effects on their behaviour, such as toileting indoors, being more clingy, or showing more aggression. Cats that are frightened in this way may also develop abnormal behaviours such as overgrooming or over-eating. Sometimes cats are wary of going out through a cat flap because it is very open and exposed on the outside and they feel vulnerable to attack. Providing your cat with some 'cover' such as some plant pots, just outside the door may be enough to help him to get outside safely. If your cat is very fearful, and the other cat is coming into the house, it may be best to temporarily close off your cat-flap to prevent him coming in. This will make your cat feel much more secure within the house. In this case, you will need to make sure that your cat has lots to do inside - enriching the environment with toys, climbing frames, hiding places and puzzle feeders will make staying inside more fun. There are many cats available for adoption across the country in our branches and adoption centres – take a look at our guide to getting a cat with Cats Protection, or check out our most popular FAQs below. Where is my nearest branch or adoption centre? For a list of our branches and adoption centres, Find us. How do I find the National Cat Centre (NCC)? Our National Cat Centre is based in Chelwood Gate, West Sussex. If you're looking to visit, click on Find the NCC. What is a homing visit? We want to make sure we find the perfect cat for you and that the cat will be happy in his new home, which is why we organise a homing visit. All cats have different characters and varied past experiences and a home visit helps match the right cat for your circumstances. If you've got any questions, a homing visit is the perfect opportunity to ask us any questions you may have - download our guide to learn more. Do you have any pedigree cats? A lot of the cats rehomed by Cats Protection are non-pedigree, but we are seeing increasing numbers of pedigree cats coming into our care. If you're looking for a pedigree pet, check the branch and adoption centre websites regularly - there are still plenty of non-pedigree cats looking for a home! If you are unable to get a pedigree cat from us, you may want to try the rescue arms of many breed societies. Details of these can be found via publications such as Your Cat or Cat World, or by phoning the Governing Council of the Cat Fancy (GCCF) on 01278 427 575. Alternatively, visit the GCCF Website for more information. Do you have kittens available? Cats Protection does have kittens for rehoming, particularly during the breeding months, but we would encourage you to think about rehoming an older cat, as they have many fantastic qualities. 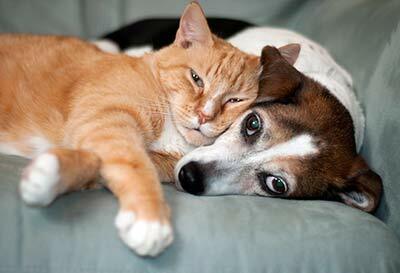 Unlike a kitten, an older cat is housetrained and they tend to be calmer. Keeping your cat healthy is very important and there are many things to consider in terms of veterinary care and routine treatment. It is worth remembering that cats should not be given cow's milk because they can be intolerant to lactose, a sugar found in milk, and giving a cat cow's milk can cause diarrhoea. Should I use a cat collar? Cats Protection believes that all owned cats should be identified in order to trace their owner should they become lost or injured. The preferred method of identification is an implanted microchip as this is permanent and safe. If an owner also chooses to fit a collar with their contact details attached, CP advises the use of a ‘quick release’ or snap opening collar in preference to an elasticated one. This means that the cat is less likely to be trapped should the collar become caught or tangled. The collar must be fitted correctly ie two fingers should fit snugly underneath it when the cat is wearing it. A cat’s leg or jaw may become caught in an elasticated or ill-fitting collar and this can result in serious injury. The fit of a collar can change over the years so it is important to check the fitting regularly and also ensure the collar is not damaged. Any damaged collar should be replaced immediately. Caution should be exercised when attaching any dangling item to the collar such as a bell or ID tag, due to the risk of entrapment. Do lilies pose a threat to my cat’s health? Lilies are extremely poisonous to cats. Signs of poisoning can include continued vomiting, blindness, paralysis, renal failure, coma and death. It is not only the ingestion of the plant that can cause such signs in cats, brushing past the flower and then grooming the pollen from the fur can also have the same effect. It is currently thought that all parts of the lily plant can be toxic to cats, including the leaves and petals, not just the stamen or pollen and the toxic dose is unknown. Identified as the most dangerous types of lily are: the Easter Lily (Lilium Longiflorum), the Tiger Lily (Lilium Tigrinum), the Rubrum Lily (Lilium Speciosum), the Stargazer Lily (Lilium Orientalis), the Japanese Show Lily (Lilium Lancifolium), Asiatic Lilies and species of the Day Lily (Hemerocalis), but do take care with all types of lily. Lilies are becoming increasingly popular in bouquets and incidents of poisoning are increasing according to the RSPCA, but do not panic, just use your common sense when dealing with lilies and avoid including them in bouquets. The RSPCA is currently campaigning for clearer labeling about the dangers to cats on bouquets and plants. What diet should I feed a cat? Cats are carnivores (meat-eating animals) and should not be fed a vegetarian diet. Also avoid feeding a cat dog food as it doesn't contain the correct nutrients for felines. Nowadays, commercial cat foods are specially designed to meet a cat's dietary needs and provide all the nutrients they need. Kittens, pregnant and lactating queens have specific nutritional requirements. How can I keep my cat's teeth clean and healthy? Many adult cats suffer from heavy build-up of plaque or calculus on their teeth which causes them great discomfort when eating and will eventually lead to a refusal to eat and/or teeth loss. Plaque and calculus can be removed by a veterinary surgeon while the cat is under a general anaesthetic. You can also buy food which loosens plaque and calculus while eating and teeth cleaning products are available. Many cats do not like having their teeth brushed; however, if brushing is started when they are young kittens tolerance levels increase. 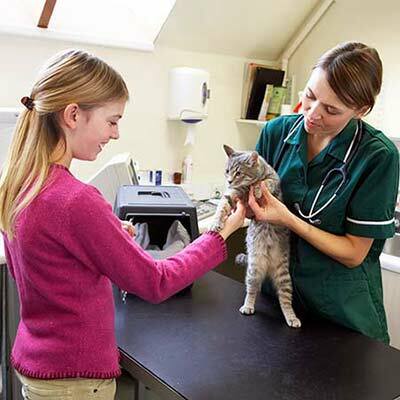 What vaccinations does my cat need? Can FIV (feline immunodeficiency virus) be passed from cats to humans? No. This virus cannot be passed from cat to human. It is transmitted between cats via bodily fluids, most commonly by saliva through bites and in some cases from mother to kittens. Affected cats have an ineffective immune system and are vulnerable to subsequent infections (eg chest infections). However, some cats infected with the virus may live a full, healthy life. Cats with FIV shoud be kept indoors to reduce the spread of the disease to other cats. Currently there is no vaccine available against FIV in the UK. What should I do if my cat is hit by a car? Only move your cat if it is absolutely necessary as movement could cause further damage. If you have to move him because he is in a dangerous place or your vet advises you to do so, follow this technique. Place a board, tray or coat behind the cat, gently slip both hands; palms facing upwards, under his shoulders and hindquarters and slide him onto the board (take care not to disturb his position in case of injury). What should I do if I discover an injured cat and I am not the owner? If the cat is moveable, take him to a vet and inform the veterinary staff that you are not the owner. If the cat has no identification, spread the word in your neighbourhood that you have discovered an injured cat and taken him to the vet. Putting up some posters may help to inform the owners of their cat's whereabouts. Cats, like humans, can burn in strong sunshine, with white and pale-coloured felines being the most a risk. If you have a pale-coloured cat, make sure that he has sun block on his ears and nose, the two areas most likely to burn. Use a waterproof, non-toxic sunscreen which your cat can’t lick off and reapply the cream throughout the day. Ask your vet for a suitable sun cream to use. Try to keep your cat indoors between 10am and 3pm this is when the sun is hottest. Always provide a shady retreat for hot cats. Cats Protection is dedicated to rehoming cats, whether individual circumstances have changed or pets have been left abandoned. If you suspect that someone is being cruel to an animal, contact the RSPCA on 0300 1234 999 or visit their website. While Cats Protection is a welfare and rehoming charity, we do not investigate cases of cruelty. I can no longer care for my cat, what should I do? There are various reasons that cats are signed over to our care, from relationship break ups to elderly people having to go into a care home. Although it can be a heartbreaking time, with some patience there is every chance Cats Protection may be able to assist you. Our branches can have long waiting lists for places in pens and with so many requests for help, branches have to prioritise and give assistance to cats in dire and immediate need of help. While our adoption centres tend to have more facilities available, they can become busy at peak times. You can find the phone numbers of local branches and adoption centres on our website or by phoning 03000 12 12 12. Branches will often have answer phone systems as many volunteers are at work - your call will be returned as soon as possible. It is important that if placing your cat into Cat's Protection's care, you'll be asked to sign and confirm this - unfortunately, this really is your last opportunity to reconsider your decision as details of the cat's new owner cannot be released at a later date. There's a stray in my garden, what should I do? We would advise you ask your surrounding neighbours whether there is a cat missing - many cats believed to be strays do in fact, belong to someone locally. In many cases, we will not be able to come out and collect a stay cat and immediately and would ask you to look after and feed the cat until we can get someone to collect him. During the winter especially, we will ask whether there is somewhere dry for the cat to go and food for him to eat, until we can visit. If the cat is injured, we will ask you to take the cat to the nearest vet. Once the cat is stable and the vet confirms that it has no owner, they may contact Cats Protection and request we take him into our care. If you've lost or found a cat, report it using the Animal Search UK website - you may be lucky enough to be reunited with your pet! Cats Protection promotes neutering as an effective way to reduce the number of unwanted cats in the UK. As well as providing education on the process, we also seek to provide financial assistance for those in financial hardship. When can a female cat start reproducing? Puberty usually occurs at around five to eight months in cats, although it can happen as early as four months depending on the breed of cat. 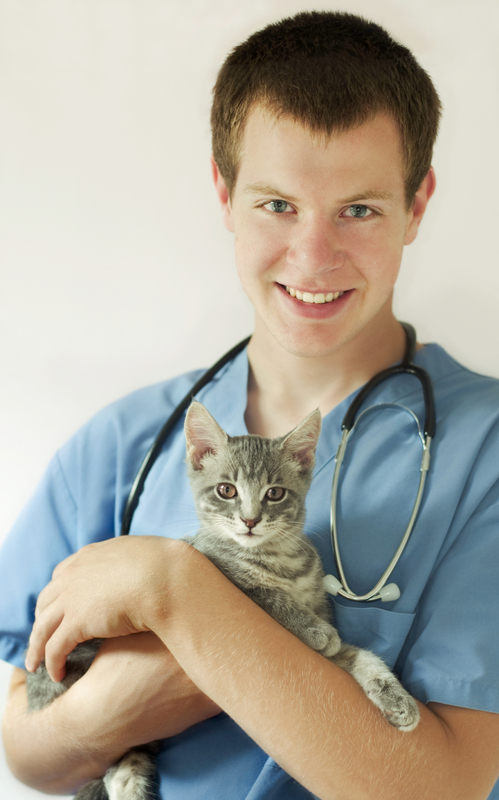 We recommend neutering both male and female cats from an early age. However, it is important to note that the vet responsible for your cat will specify when they are prepared to carry out the neutering operation - usually at around four months. Cats Protection’s current policy is to neuter pet cats from four months and ferals from weaning age. Can you tell me about kitten neutering? How can I tell if my kitten is male or female? To tell if your kitten is male or female, you will need to lift the tail and look at the back end. Both sexes will have two holes but on a female the holes will be fairly close together, whereas on a male there will be a space where the testicles will develop. WIll the neutering process hurt my cat? What aftercare will the cat need? Vets usually advise that the cat is kept indoors for a few days after surgery and may need to wear a buster collar, a lampshade shape collar to stop it from chewing its stitches. Will the cat get fat? I or someone else I know has a lot of cats we need help with neutering. Can CP help? CP can provide help with neutering cats in situations where there are many cats in a household. We take a non-judgemental approach, recognising that in these cases fast action is needed. To achieve success we are reliant on owners cooperating with us throughout the process. We can sometimes take a third party referral, but can only act with the consent of an owner. We are not a law enforcing body nor do we have any legal powers, so can only act with an owner’s consent and collaboration. Help is available through our branches, adoption centres and Helpline. Please contact 03000 12 12 12 for more information. I need help with a feral colony. Can CP help with neutering? Feral cats, or those born wild, are equally protected in law as domestic cats and are more susceptible to disease. Simply removing feral cats isn't a long-term solution - a new colony will often move in. The best option is to neuter all of the feral cats within as short a time frame as possible, reducing the size of the colony and therefore keeping vermin levels down. Cats Protection may be able to help towards the cost of neutering a feral colony, provided the cats are returned to their original site. While Cats Protection can assist with neutering costs, this can only be used for this purpose and cannot be used for other veterinary treatment or euthanasia. Your application needs to be made in advance of neutering taking place - our local branches may be able to assist with costs and pratical assistance, dependent on resource. If you'd like more information on feral neutering, please phone our helpline on 03000 12 12 12, choosing option 2 (lines open from 9.30am-1pm). What behavioural signs does an unneutered tom display? Unneutered toms tend to be larger and generally more confident than neutered males. They tend to maintain a large territory area, as they will cover a large area looking for females that are coming into season. Because it is so important for toms to maintain a large territory to reproduce, they are more likely to fight with other cats and leave urine spray marks inside or outside. Environment is important for cats and moving house can often be as stressful for them as it is for you. Lessen the impact by keeping your cat away from the mayhem of packing and on the moving day itself, transport him with familiar items so he doesn’t feel unsettled. It is particularly important to keep your cat inside the house until he has settled in to his new environment, with more timid cats needing to be kept in the home for longer. If you’re looking for further tips on moving home, check out our guide. I live in a flat. How can I safely provide fresh air for my cat? If you live in a flat and your cat has to live an indoor life, you can safely provide him with fresh air by screening your open windows. Put a wire mesh over your window - it allows air in but stops your feline friend from coming to any harm. Don't allow a cat out onto a narrow ledge or balcony - heights are a great risk for all animals. How can I encourage my cat to stay in my garden, so as not to upset the neighbours? While it is impossible to eradicate your cat's natural desire to explore, it can be curbed somewhat by neutering. Making your garden as interesting as possible might encourage your cat to stay, or using a fencing kit - although this can be costly and is not always 100 per cent effective. Neighbours can often become upset by cats toileting in their garden - you can encourage your cat to use your own garden by providing a good toileting site within your own boundaries, made up of easily raked material that is private and secluded. How can I keep the neighbourhood cats out of my garden? It is important to remember that cats have territory areas not neccesarily matched by human boundaries, but there are a number of humane defences you can use to deter them from entering your garden. Shooing and clapping a cat away might be a great short-term way to deter them, but won't stop cats entering your garden completely. Many use Catwatch, an ultrasound alarm that senses an animal's movement and triggers a high-pitched noise - research has found, however, that these products do not tend to deter cats very effectively. • Shoo them away by shouting or clapping your hands. • Squirt water using a pistol or movement-sensor sprinkler. • Install an electronic deterrent emitting a high-pitched sound. • Erect high fences around the property. • Avoid leaving food and dustbins within reach. • Plant shrubs closely to prevent cats finding a place to dig. • Spread chicken manure around beds and borders - use Soil Association approved pellets rather than fresh manure. • Cover parts of your garden with stone chippings, pebbles or small rocks. • Use Lion dung-infused deterrent products such as coleus canina or crushed egg shells. • Hardy plants and tall planters can help to reduce the effects of cats marking their territory through spraying. Should I keep my cat in at night? Cats are natural hunters, making them more active at night time. There is a slightly increased chance of road accidents when cats are out at night and as a result, it is best to keep cats indoors at night where there is a risk to the local rodent population. A cat should never be locked out all night. If your cat is used to being active at night, it can become restless and stressed when kept in. If it is neccesary to keep them indoors, an indoor environment should provide them with plenty of things to do - from toys and climbing frames to puzzle feeders. How can I give my cat the exercise and stimulation he needs? Cats are natural hunters and any time spent not doing this needs to be filled up with both exercise and mental stimulation - the best way to use up your cat's energy is to play with him. There are lots of toys available in pet shops, or alternatively you can make your own. Ping pong balls, string and old plastic bottles make great items for playing with as cats are mainly attracted to anything novelty or with movement. Change toys regularly to keep things interesting and provide catnip toys for catnip-loving felines. It's no surprise that cats like to climb and hide inside things, so providing shelves, climbing frames and boxes are sure to keep them entertained. Cats also like scratching, so its a good idea to get a scratching post, in case he begins to use your sofa! My cat keeps going to my neighbour's house because they are feeding him. What can I do? • Fences. Cats are great climbers and jump over most fences. However, a two-metre high, close boarded fence, together with a hedge parallel to the fence, will encourage your cat to remain within your garden. Angled trellis, netting, taut wire or string could be put on top of the fence as a further deterrent, but make sure your cat cannot become ensnared or injured. • Plants. You may want to consider dedicating a corner of your garden to ‘catfriendly’ plants such as catnip (Nepeta cataria), mint, cat thyme (Teucrium marum) and lavender. A patch of longer grass can provide a soft bed and cats may also nibble on it to help cough up hairballs. 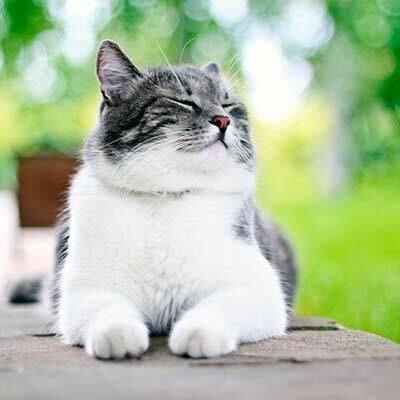 Plants – without thorns – can be placed to give your cat a shady spot to lie in during those hot and sunny days while logs provide excellent outdoor scratching posts. Many cats can feel threatened in exposed spaces, so ensure your cat has plenty of hiding and resting areas in the garden. Someone is claiming my cat as their own. What can I do? If you have not already done so, try to resolve it with the person amicably. If you can demonstrate evidence of ownership (vet records, microchip details, adoption papers, photos of the cat for example) that may be enough to resolve the issue. If this is not possible or your attempt is unsuccessful, seek advice from your local Citizens Advice Bureau. It may be necessary to seek independent legal advice. Cats Protection is a welfare and rehoming charity and, as such, is not set up to give legal advice to members of the public. For most cats, regular combing and brushing is particularly important and removes loose hair, dirt and dust, essential for preventing furballs. Daily grooming also ensures you spend quality time with your cat. Take a look at our tips for essential cat care, from worming to fleas. What is the best way to identify my cat? We recommend mircochipping as the best means of identifying your cat, as a chip is permanent and will not cause injuries like collars can. How do I toilet train my new kitten/cat? Cats are naturally clean animals but a new kitten will still need to be shown how to use a litter tray and toilet correctly. Provide a litter tray filled with commercial cat litter and keep it in the same place for the kitten to easily get to it. You'll need to clean it regularly. Train your kitten to toilet in the litter tray by taking him there after every meal and when he wakes from sleep, so that he gets used to a routine. Wiping his bottom with a moist tissue can encourage toileting - this action mimics the way a mother cat would lick her kitten's behind to make him toilet. It is best to hold a cat or kitten by putting one hand under his chest and supporting the rest of his weight with your other hand. Kittens, in particular, must be handled gently as their bones are fragile. Contrary to popular belief, picking up a feline by the scruff of the neck can be painful. What are worms and how can I stop my cat from getting them? There are two main types of worms that infect cats - roundworm and tapeworm. Most cats will suffer from roundworm at some point in their lives and infection is not always visible. It is advisable to treat for roundworm in adult cats and for kittens. Tapeworm, if present, will be noticeable as segments are passed in the cat's faeces and can be seen clinging to the animal's legs. When dry, the segments are cream coloured and look like grains of rice. Good treatments for both tapeworm and roundworm are available from veterinary surgeries. Please consult your vet for advice on treatment frequency, as this depends on the preventative product used. How do I guard against fleas? Fleas often affect cats, even meticulously clean ones, because the eggs can survive in the environment for a very long time. Fleas can be present all year round especially in milder climates. The good news is that they are easily prevented and treated using the very effective flea treatments now available from vets. How do I spot ear mites? An infected cat or kitten will scratch his ears, shake his head and sometimes damage the skin on his ears and temples. Ear mites live on dead skin inside the ear and brown wax will be seen in the outer ear. Treatment is required to eliminate them so it is best to take your cat to the vet. Owning a cat is a big responsibility and should be carefully considered. Cats can live up to 20 years or more and there are essential costs to be taken into consideration - from vet care to essential items. If you're thinking of owning a cat, check out our guide to cats and people for essential advice. • Somewhere suitable to live. • Addressing any need to be housed with, or apart from, other animals. • The opportunity to express normal behaviour. • Protection from pain, suffering, injury and disease. • The laws also increase the penalties for those who commit the most serious offences of cruelty against animals. The laws also increase the penalties for those who commit the most serious offences of cruelty against animals. I am going on holiday. What can I do with my cat while I am away? Cats are territorial and happiest in familiar surroundings, so if you are going away for a while it is best to make arrangements with someone you can trust to take care of him in his own home. If this isn't possible you should contact the International Cat Care on 01747 871 872 or visit its website for a list of recommended boarding catteries. (Remember your cat will need up-to-date vaccinations before entering a cattery). My cat has gone missing, What should I do to try and find him? It is always difficult for the owner when a cat goes missing, but there are plenty of ways to seek out your furry friend and many reappear months after disappearing. Thoroughly search your house and garden, looking particularly in warm spots such as under beds, in cupboards and behind wardrobes. Ask neighbours to check their sheds, garages and outhouses for signs of your cat too. If your cat remains lost, it is a good idea to phone around local veterinary surgeries where injured cats are often handed in. Make calls to local animal rescue organisations and the local council and consider putting posters up in the area, or placing an advert in a local newspaper. The national lost pet databases are well worth using too. Cats Protection recommends Animal Search UK to list your lost pet. Owning a cat is something to be thought about carefully and cost is a big implication. There are essential cat care items, like food, litter, toys and bedding as well as routine veterinary care (annual health checks, vaccinations, neutering, de-worm and de-flea treatments). Getting your cat microchipped is an important investment, as well as pet insurance to help towards the cost of major illness and emergency treatment. How will having a cat affect my lifestyle? Think carefully before getting a cat as it is a real commitment. You'll need to make time for play, grooming and fuss as well as making sure your new cat or kitten doesn't become a nuisance to neighbours. I am allergic to cats, is there a way I can own one? An allergy to felines doesn't neccesarily mean you cannot own a cat. There are now products on the market which, if used regularly, aim to help with allergies. Petal Cleanse, made by Biolife International, is a great product and when applied to a cat weekly, can reduce dander from the coat which can cause allergic reactions. Alternatively, some breeds of cat can be better for allergy sufferers as they have less fur, for example Devon Rex or Cornish Rex. For more information on Biolife, you can visit the website or call its advice line on 01608 686 626. I have developed asthma, would it be best if my cat left our house? Having asthma doesn't neccesarily mean that you need part with your cat. Petal Cleanse is a product that decreases allergy-causing dander and can be effective for those with asthma. Visit Biolife's website or phone its allergy advice line on 01608 686 626.